Expanding preschool opportunities will almost certainly produce benefits that exceed its costs, with measurable benefits of increased school readiness, higher academic achievement. This will translate into a higher educated workforce with greater potential for individual and community prosperity. 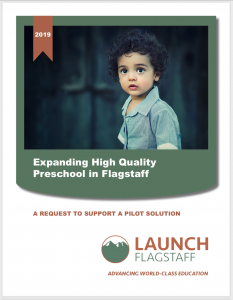 We have initiated a community conversation focused on piloting a collectively-funded project that will provide high-quality, full-day, year-round preschool for children who are not otherwise being served in existing preschool sites. Our goal is to seat the first class of students in January, 2020.